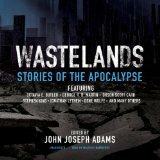 Just released by Blackstone Audio & Skyboat Media – WASTELANDS: STORIES OF THE APOCALYPSE. This is a fabulous collection of 22 tales of the best post-apocalyptic literature from the last two decades! I had the pleasure of narrating two wonderfully chilling pieces – MUTE by Gene Wolfe and KILLER’s by Carol Emshwiller. The collection is edited by John Joseph Adams and 11 of us narrators were chosen to bring life to its pages. The stories are an exploration of what it means to remain human in the wake of Armageddon and are from many of today’s most renowned authors of speculative fiction—including George R. R. Martin, Gene Wolfe, Orson Scott Card, Carol Emshwiller, Jonathan Lethem, Octavia E. Butler, and Stephen King. The entire anthology is available at downpour.com. I hope you will check it out! This entry was posted in Audio Books, Narration, News and tagged Blackstone Audio, Carol Emshwiller, Downpour.com, Gene Wolfe, George R. R. Martin, John Joseph Adams, Jonathan Lethem, Octavia E. Butler, Orson Scott Card, skyboat media, Stephen King, Susan Hanfield Narrator. Bookmark the permalink. ← The 2014 Audie Awards with Ender’s Game Alive!